"This will be a game night to remember." Somehow directors John Francis Daley and Jonathan Goldstein manage to make the goofy premise of a party game turned real with actual dangerous consequences its players are initially unaware of a more than hilarious and very enjoyable action comedy film. Game Night not only parodies gamify-ing real-life but also a fair amount of action movie tropes with a great cast of willing participants. 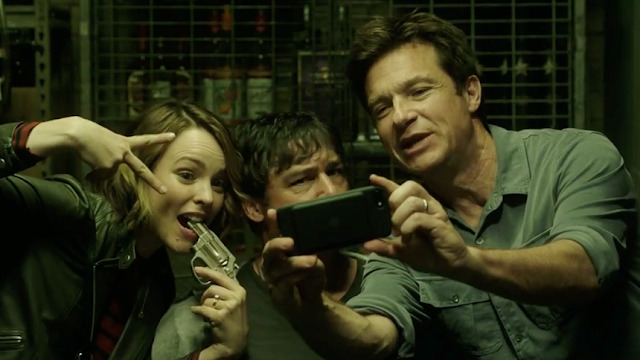 Jason Bateman and Rachel McAdams star as a fun, ultra-competitive suburban couple, Max and Annie. Their cute chemistry and playful antics really ground the film before it all-out antics. A very spry Kyle Chandler Max's more successful and overbearing brother revels in being able to have fun. The buddy/buddy brother dynamic is well developed and its slow burn reveal as the titular game night gets more intense and serious with guns, thugs, violence, fight clubs, and car chases to boot. A mismatched Billy Magnussen and Sharon Horgan provide some nice conflict as co-workers set out to antagonize each other while Lamorne Morris and Kylie Bunbury are another hilarious couple with an ongoing celebrity gag that proves more than worthy of its random insertion into the story. The chemistry of all the pairs along with Bateman, McAdams, Chandler, and the other welcome familiar faces of supporting actors really makes the action and comedy work despite its basic yet outlandish plot. Among the stacked cast, it's really an incredible performance by Jesse Plemons that steals the film. His simple but effective creepy neighbour cop character comes back in spades to pay off in comedy gold. His flat, deadpan joke delivery is nothing short of sensational played against the rest of the cast. Screenwriter Mark Perez's loose script riffs on the jokes within jokes with characters mocking callbacks and the coincidental, unfortunate circumstances they are in. It almost but never quite breaks the gamification of the story and its cause for confusion. The balance of competing genres reveals a stark tension its characters manage to walk without breaking the momentum of the film. Game Night is one of the funniest studio comedies produced in years. Daley and Goldstein's sharp direction and McAdams luminous performance really make the film sparkle with joy. Somehow, the film elevates its fun and style above its fairly standard, predictable premise. There's so much more going on than players thinking they're still playing a game that's actually real-life. The refreshing dark comedy comes from turning that basic idea and self-referentially playing on it with great results.